A dependable digital hearth for your modern space. Everyone hates the uncomfortable chill of a drafty room. 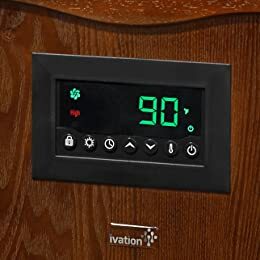 With the Infrared Quartz Mini Heater by Ivation, you can create a warm, cozy environment virtually anywhere in your home. Designed for superior eco-efficiency and compact versatility, this space heater utilizes six infrared quartz elements to raise and maintain room temperature with the touch of a button. Just plug it in, and use the remote control or LCD panel to set your ideal heat mode, program a timer, or manually adjust the temperature to the precise degree. The attractive unit features a lovely wood casing and wheels so you can display it proudly in any space before moving it to another room. It also comes built with multiple safety features to protect children, pets, and the entire family. Unlike a traditional space heater, infrared technology radiates heat faster and with more even distribution. This allows objects in the home to soak up warmth, resulting in a consistent temperature throughout the entire space. Enjoy a comfortable environment without losing precious moisture in the air. 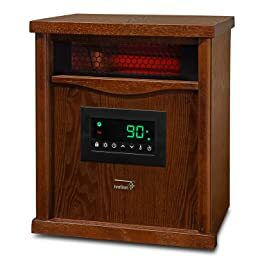 Designed with children, pets, and parents in mind, the infrared heater is easy to use but comes ready with plenty of advanced safety components. If the unit tumbles over, or its sensors detect a fire risk, an internal switch automatically powers off the elements. Users can also initiate the child lock at any time, preventing curious little ones from changing settings. Since it stays cool to the touch, you can also ensure kids and pets aren't injured by contact. Replace your old eyesore with a contemporary cabinet made from durable materials that'll last for many seasons to come. The piece's decorative dark wood veneer fits perfectly with your existing dæ®‹or, infusing subtle charm and sophistication in any room. The casing also comes with four discreet caster wheels for effortless mobility. The heater's convenient remote control lets you enjoy every powerful feature from the comfort of your couch. Pop in 2 AAA batteries, and keep it on hand to adjust your chosen heat mode, initiate a timer, or change the current temperature value by precise degree. You can even turn on the unit's safety lock feature from afar. Requiring minimal maintenance beyond cleaning the removable air filter, the Infrared Quartz Mini Heater practically preserves itself. The unit is compact [13" x 10.8" x 16.2"] and lightweight [20.6 lbs.] for rolling, and arrives fully assembled for your enjoyment anywhere a 3-prong outlet is available. Although intuitive to use, the heater comes with a helpful user's guide for additional support. Besides its decorative appeal, you'll also love the heater's practical cost-saving benefits. Compared to wood burning, kerosene, or traditional electric space heaters, infrared quartz's green technology is quicker, more powerful, and uses less energy to maintain temperature in a room. You'll be happy to see tangible results on your next utility bill. Don't plug another electrical device or an extension cord into the same outlet as a heater, which can cause overheating. Dimensions: 13" x 10.8" x 16.2"